The newly acquired slugger Jay Bruce hitting his first homer as a Met, a three-run shot in the fifth inning, which gave the Mets a 4-0 lead. The Mets outfielders have a ritual after each victory. They get together and exchange congratulations, leaping in the air and punctuating the celebration by swinging their arms for a low-five. 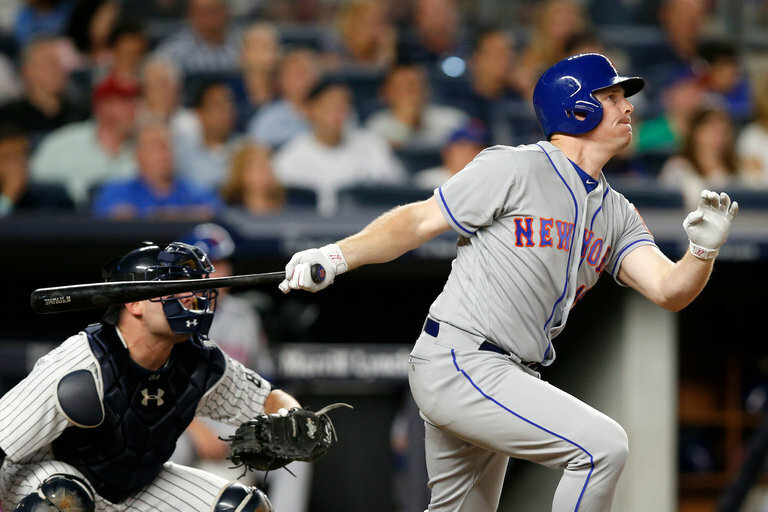 After the Mets’ 4-1 victory over the Yankees on Thursday night in the Bronx, Jay Bruce showed that he had not yet mastered the routine. When he converged with Curtis Granderson and Alejandro De Aza, Bruce mistimed his jump and then stood awkwardly waiting to slap hands. Bruce’s mistake was forgivable. The Mets might not have been victorious without his three-run homer in the fifth inning, his first base hit for the team.